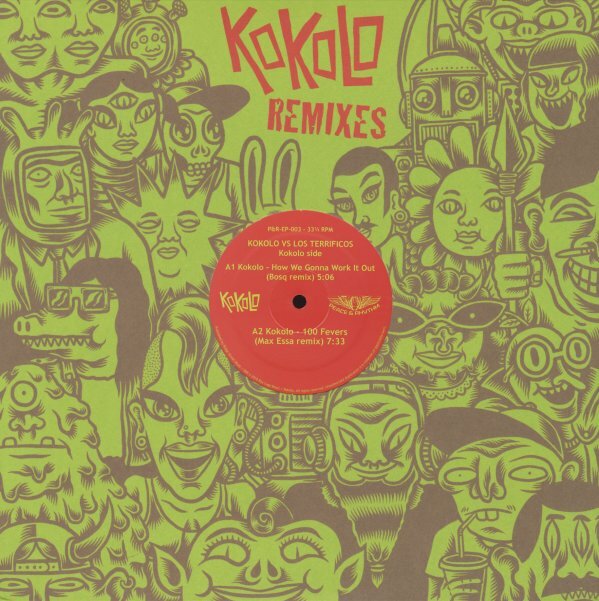 A charged little sampler pitting 12 inch remixes of cuts by modern Afrobeat veterans Kokolo against funky Latin groovers Los Terrificos – remixed by Bosq, Max Essa, D Briggs and Studebaker Hawk – and everybody wins! The "vs." billing is sort of in jest, as both combos are led Ray Lugo and Jake Fader – it's really just showing the stylistic range of the principal players and their excellent combos, all the more so with the remixes bringing in a club ready vibe without burying the rootsier live band vibes. The Kokolo side includes "How We Gonna Work It Out (Bosq remix)" & "100 Fevers (Max Essa Remix)". The Los Terrificos side includes "La Mordita (D Briggs Remix) and "Muerte En La Galera (Studebaker Hawk Remix)" . © 1996-2019, Dusty Groove, Inc.